Welcome team members of the St. John Providence Health System. If you have found yourself on this webpage, it means that you are a part of THREAD NATION and we appreciate the opportunity to serve you and your relocation needs. This webpage is designed to offer you special discounts and value added services for local residential moving within Wayne, Oakland, Macomb, Washtenaw, and Livingston Counties. Whether you are moving to a house, apartment, condo, or loft, these discounts and value added services are exclusive “Perks” designed just for you. At Professional Movers.com, we will take the time to understand your needs and provide you with solutions that will save you money, relieve your stress, and transform your perception of what to expect from a Professional Moving company. Just like many of the St. John Providence Health System, Professional Movers.com is based right here in Michigan. Our movers are local guys who have a vested interest in making sure you have a positive move experience, because after all, we live in the same community, and we know that if we do a good job, you will more than likely recommend our moving services to someone else at St. John Providence Health System. Our company prides itself on being different than every other moving company. To learn more about what to expect, and some of the things that truly differentiate us from other companies you may consider, please click here. How Does the Moving Incentives for St. John Providence Health SystemWork? 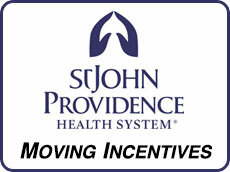 Any team member that works for the St. John Providence Health System who chooses Professional Movers.com to provide local residential moving services within Wayne, Oakland, Macomb, Washtenaw, and Livingston Counties will be eligible for Moving Incentives. Professional Movers.com will provide the following discounts and value added services to the team members of St. John Providence Health System.